Close your eyes and see the future. Radio often explored the issues of the day by imagining the days to come -- and never did it better than in the stories you'll hear in this collection! 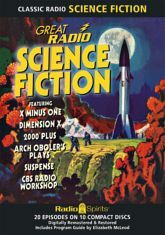 From 2000 Plus to Dimension X, this is Great Radio Science Fiction! Hear the stories of Robert Heinlein, Arch Oboler, and Isaac Asimov. Hear the voices of Orson Welles, Aldous Huxley, and more! Hear intense parables about the law of unintended consequences, creative allegorical dramas about our innate call to adventure, and terrific tales about first contact with the unknown, the fanciful, and the altogether unexpected. Includes a Program Guide by radio historian Elizabeth McLeod!